AFRICAN WOMEN IN CINEMA BLOG: Nadia El Fani, cinéaste : “Tunis as with Charlie, in solidarity!" | Pour Tunis comme pour Charlie, solidarité! Nadia El Fani, cinéaste : “Tunis as with Charlie, in solidarity!" | Pour Tunis comme pour Charlie, solidarité! Nadia El Fani, Franco-Tunisian filmmaker, feminist, threatened by Islamists in Tunisia is exiled in France. 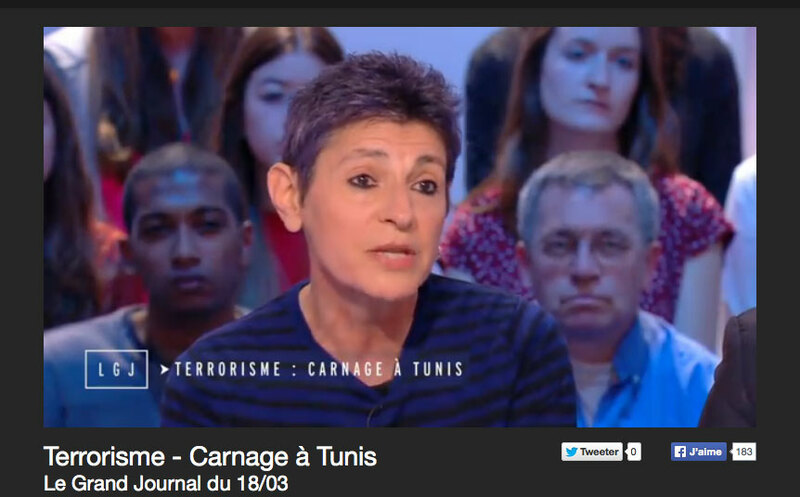 See below the transcription from French of Nadia El Fani’s discussion on Le Grand Journal du 18/03: Carnage in Tunis on Canal Plus. Nadia El Fani, féministe et cinéaste franco-tunisienne, menacée par des islamistes en Tunisie est exilée en France. "Of course, initially there is emotion, the tears that come. But then right away one remembers that the fight is long and all of those who express ideas that are different, that are against violence in particular, must come together to ensure that the country move forward." "There is also the assassination of politicians, I think also all the attacks against the police force, the army, the booby-traps targeted at the population around the country. For me it is clearly the work of Islamists. You have to look at where the violence is, where this violence is coming from today. Those who express themselves through the word rarely use violence. Those who choose violence have nothing to say." "The Bardo Museum is a symbol of culture…the history of an anti-Islamist Tunisia…It is in an area that is both cultural and political." "To me the shock [of the attack against Charlie Hebdo] is similar. I am Franco-Tunisian, I was in Paris during the Charlie Hebdo attack, and today I wrote in the Huffington Post: "Tunis as with Charlie, in solidarity" [see translation from French below]. For me the appeal is universal, it is for everyone: we must rise, we must say no to violence, principally, but also to fanaticism, to obscurantism. My point is not to repeat that I fight for secularism, but at the present it should be a universal struggle." Nadia El Fani (Huffingtonpost.fr Blog, published 18/03/2015) “Tunis as with Charlie, in solidarity"! Translated from French by Beti Ellerson. INTERNATIONAL - Today in Tunis there is horror anew... Horror again. The horror is at our doorstep, everywhere. Some kill like others speak. As if the human being is worthless. Are these the virtues that religions teach? To terrorise us... This is the effect that these terrorists try to provoke, on all of us, wherever we are. They try to say to us that security is not synonymous with freedom. This is the objective of all fascist thought! I fight with others, the many others around the world, against the idea that religion can intersect with politics and vice versa, and I sincerely believe that the answer to this orchestrated violence, which clearly, is coordinated, matters to everyone, citizens throughout the world of the twenty-first century! Let us continue to live, to go out, to enrich ourselves, especially let us work to eradicate racism in this world, inequality, injustice, and to believe in the wonderful values ​​of the Republic that all Islamists (do not be deceived!) refuse . Their goal is to establish the caliphate, ours is to preserve the Republic, the genuine one that allows one to declare "liberty, equality, fraternity"! Faced with obscurantism, terrorism, Islamism, I remain open-minded, pacifist, humanist, I am standing, firmly! Nadia El Fani: En politique, ce n'est pas grave de perdre"